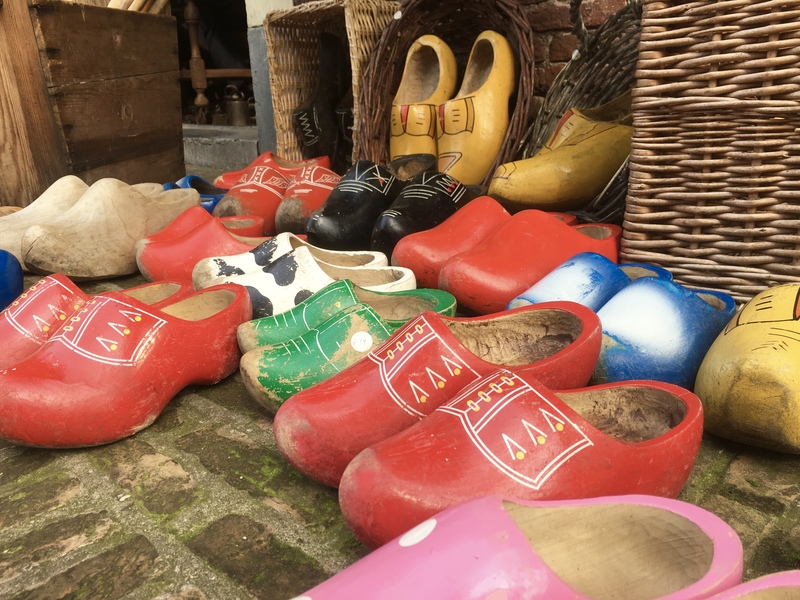 WHEN we booked our holiday to Eurocamp Duinrell in Holland, we planned to spend at least a day in Amsterdam. 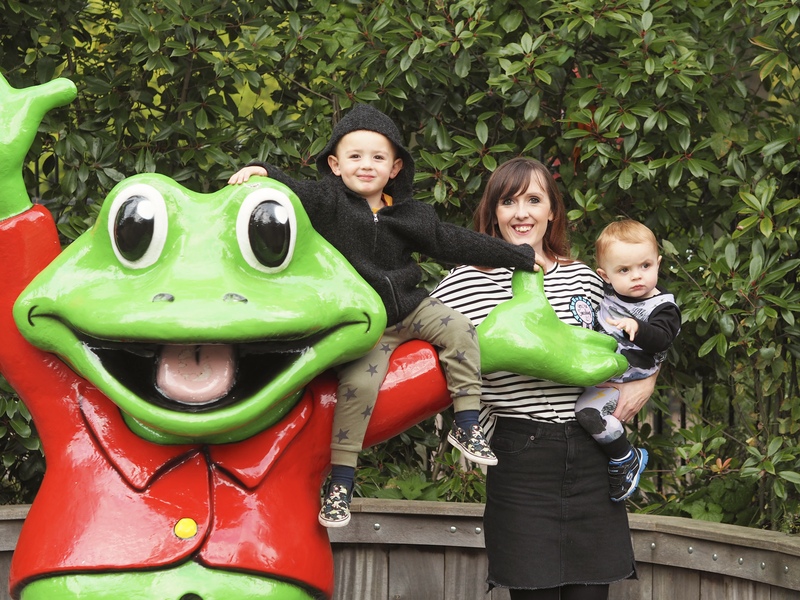 The parc is only 45km away from the city, and even though me and Stew have been there before we thought we’d take the opportunity to tick it off our little travel buddies’ capital challenge list. But, as is inevitable when travelling with small children, not everything goes to plan. We thought the 20-minute walk to the bus stop (probably 10-15minutes without little legs), half an hour bus journey to Leiden, and train to Amsterdam (plus the same back at the end of the day) would be too much for the boys – one of who decided they didn’t like walking anymore, and the other who when let loose from the pram would run in the opposite direction. 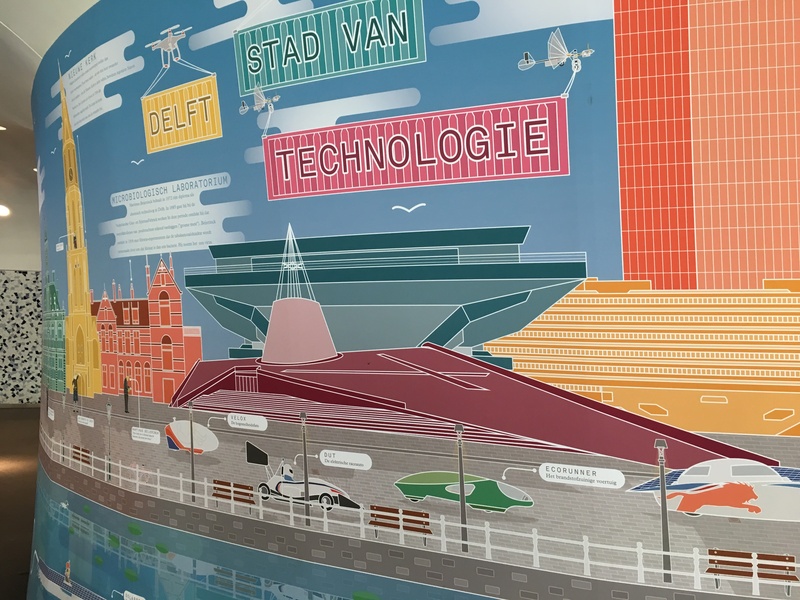 If we’d hired a car we would definitely have gone into the city, as there was a park and ride about a 30-minute drive away … next time, hey? 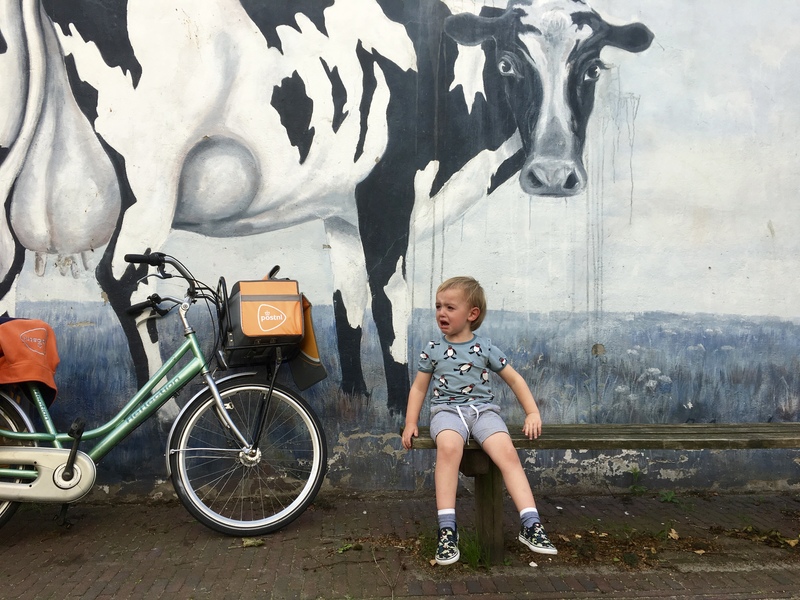 Not giving up on the day trips, especially as we’d enjoyed seeing more of South Holland on our day cycling to Scheveningen, we decided to explore Delft. 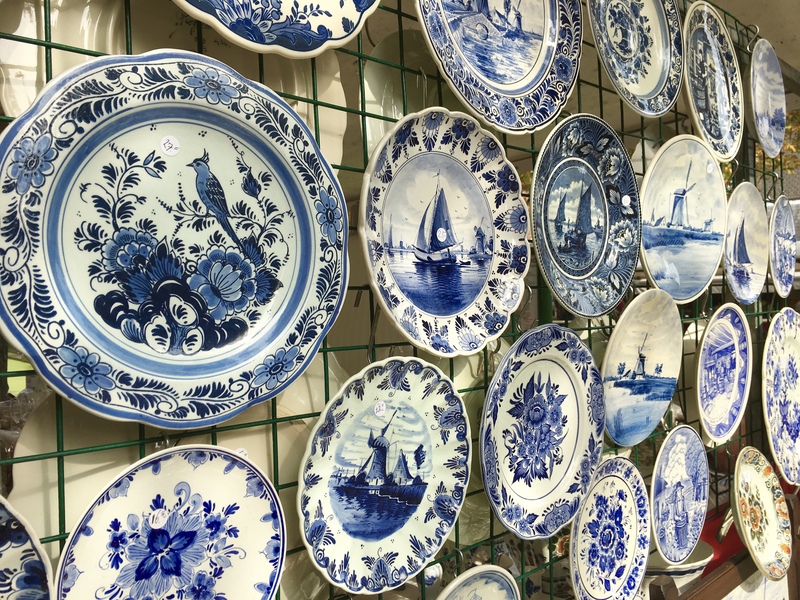 I’d heard of the famous blue and white pottery, but aside from that I knew nothing about the town itself. 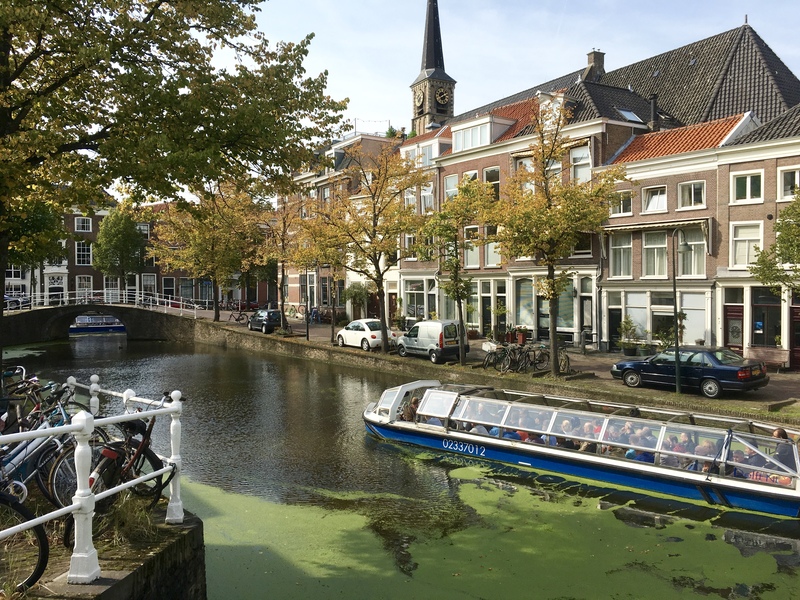 A bit of quick google imaging brought up photos of pretty bridges over canals, and we were sold. Delft it was. Ok, the outfits are a giveaway that this photo is actually from a different day! 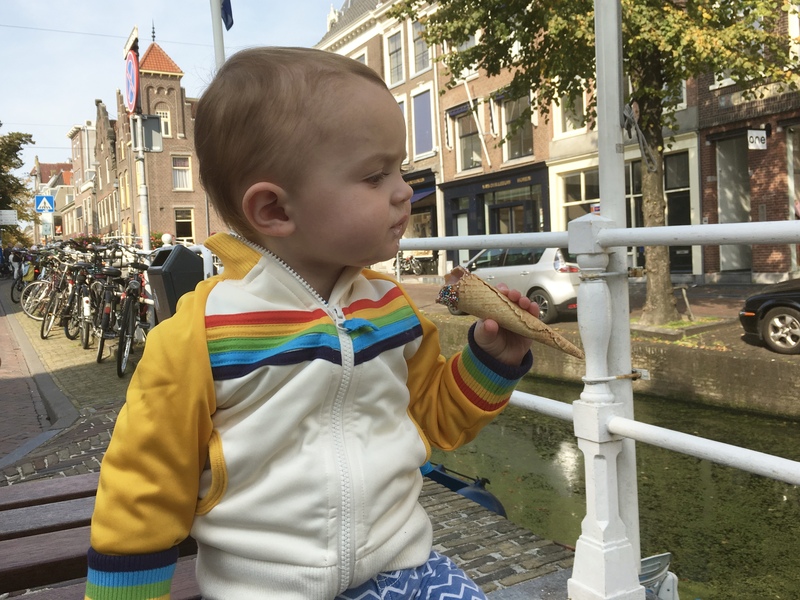 The boys entertained themselves with waffles (the Dutch kind, not Captain Birdseye) on the bus journey, and it wasn’t long before we were pulling into the train station at The Hague. The station was like something out of Santi’s dreams, with two huge escalators down to the ticket office – he likes to pretend he’s skateboarding down them – and the staff were amazingly helpful. 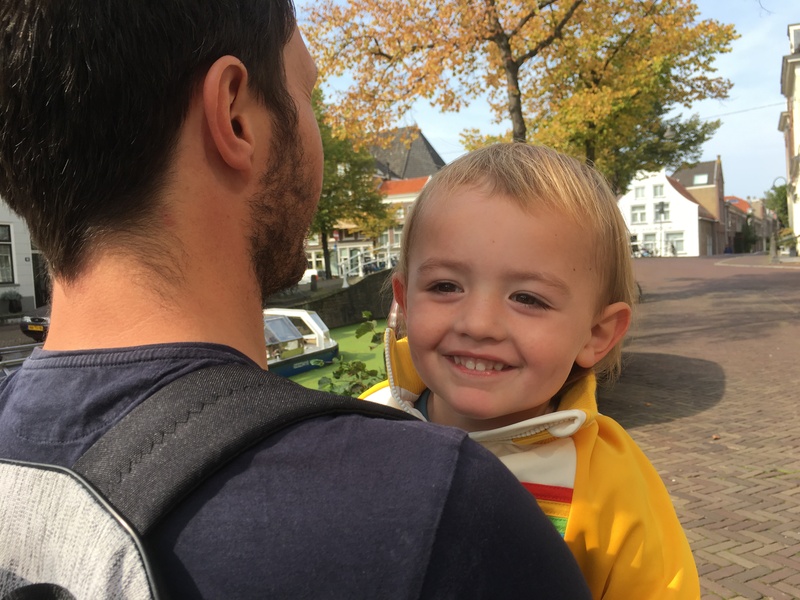 They all spoke English (as much as I would love to be able to speak Dutch, all we managed to learn were a few words before going), helped us plan our route, and even gave Santi and Ezra a sheet of stickers each – how nice is that? They spent the 30-minute train journey sharing their stickers with anyone who gave them the slightest bit of attention (pretty much everyone in the carriage), and telling people about our holiday, which was all fine until Santi didn’t understand why I wouldn’t let him take a photo of the lady opposite us. She was very nice and probably would have obliged, but it would have been VERY awkward! 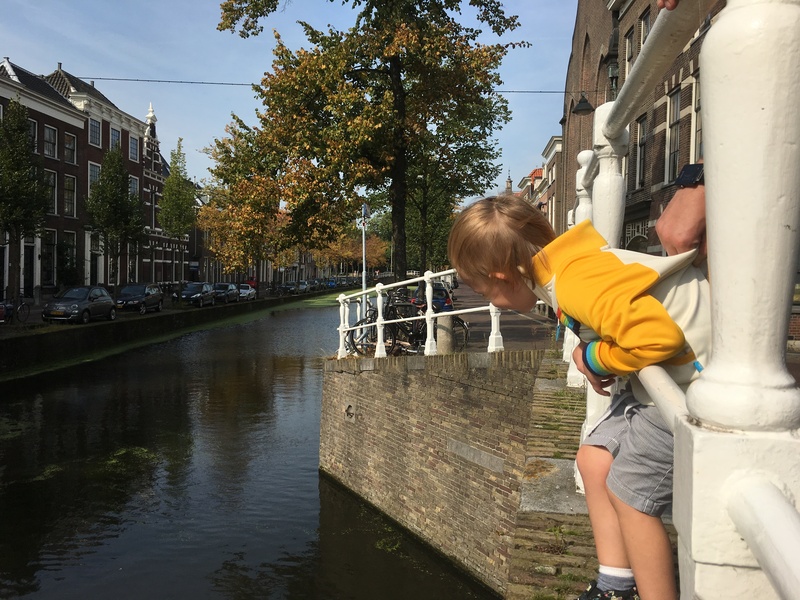 Thankfully, it was soon time to get off the train, and after a quick nappy change on a bench for Ezra ( the toilets cost a euro and didn’t have changing facilities – I wasn’t paying for him to lay on a toilet floor), and guessing which direction to go, we headed into Delft. We spotted a windmill in the distance – a big tick – and soon found ourselves on the side of a canal – second big tick. Who needs Amsterdam?! 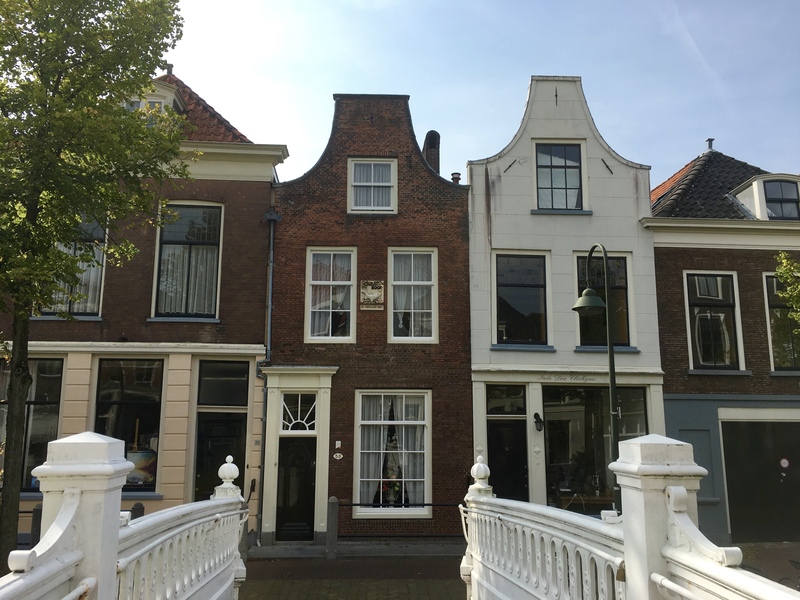 It didn’t take long to fall in love with Delft. 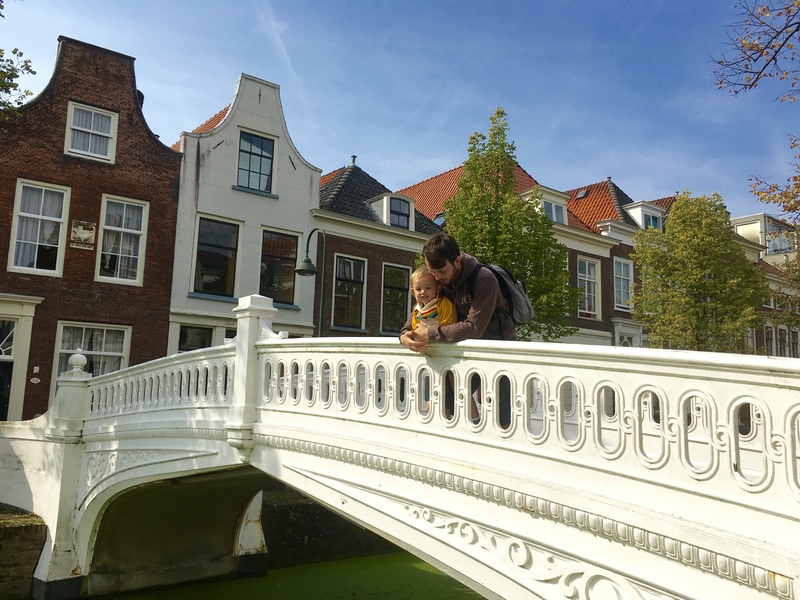 We wandered along the little canals, only passing one or two people on some streets, and it was so peaceful (even with our two boys). 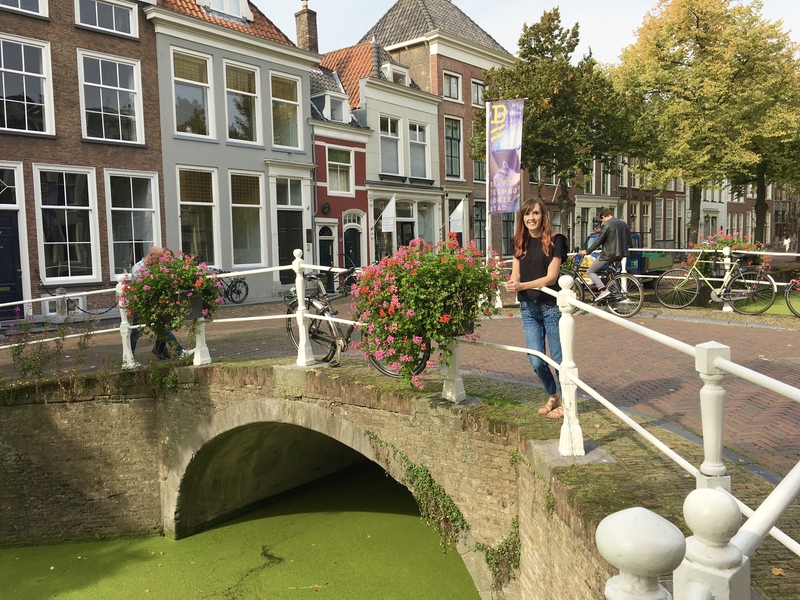 I loved all the little white bridges over the water – this one made me feel like we were in a little Venice. Of all the places you’d really not want your camera to be broken for, Delft was it. I was seriously gutted that my lovely Olympus gave up on us the day before, and as much as I tried not to keep bringing it up during the day I think I might have seriously bored Stew with my whining. But come on! Anyway, we stumbled upon the main square when Santi was following the sound of music. 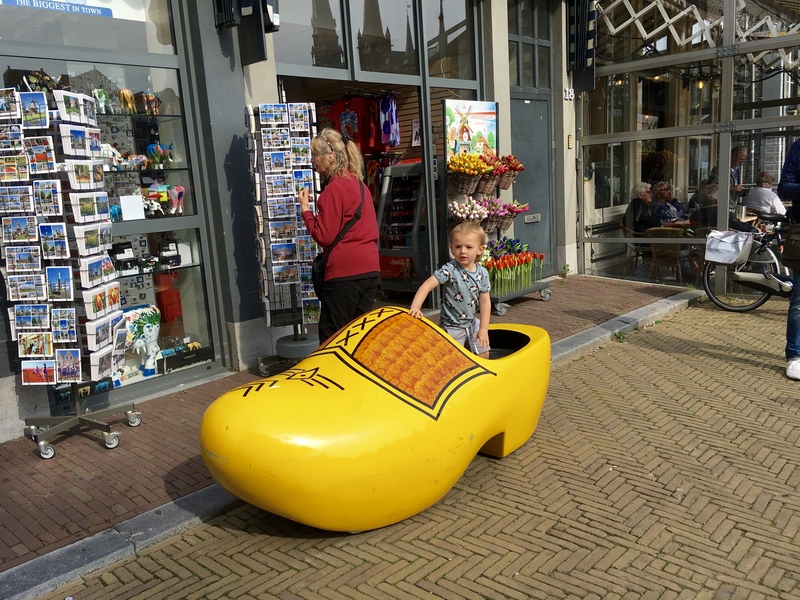 There was a man with a huge music box playing fairground-style tunes, the town hall, lots of market stalls, and the obligatory giant clog. Seeing cafes and restaurants around the square, we started to get hungry. We’ve learned from past mistakes not to eat on the main square as it ends up costing twice as much as elsewhere, so we went for a wander to find somewhere on a side street. 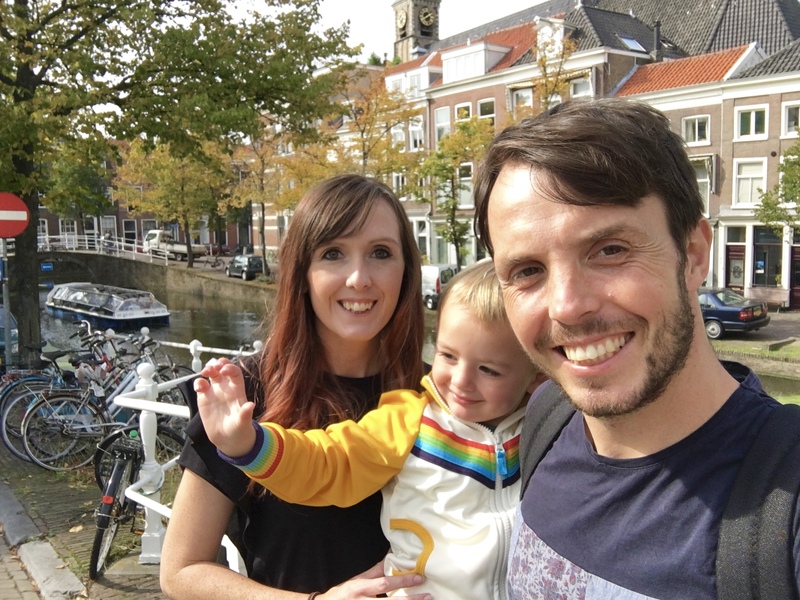 We found lots more pretty canals and lovely pastel coloured bikes to lust over, but typically nowhere to eat … so we ended up back in the square! 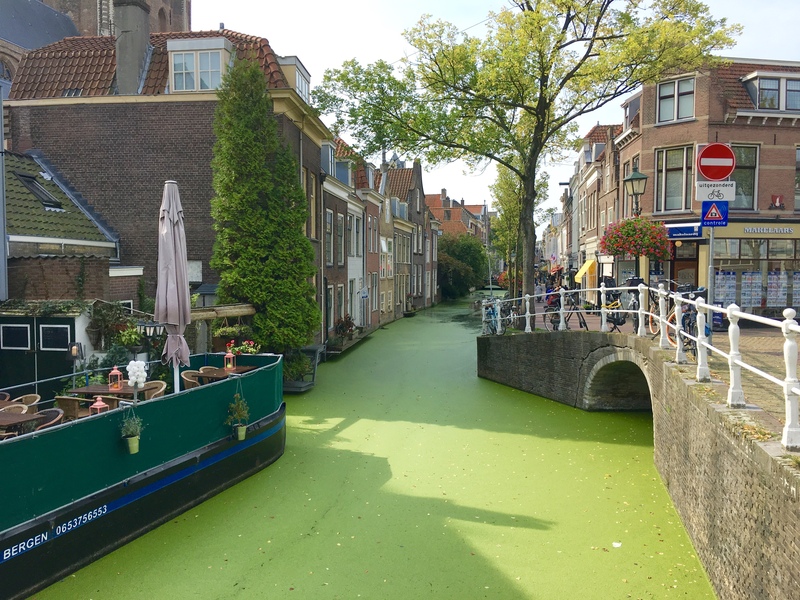 I have no idea what the green is, but all the canals were covered in it! 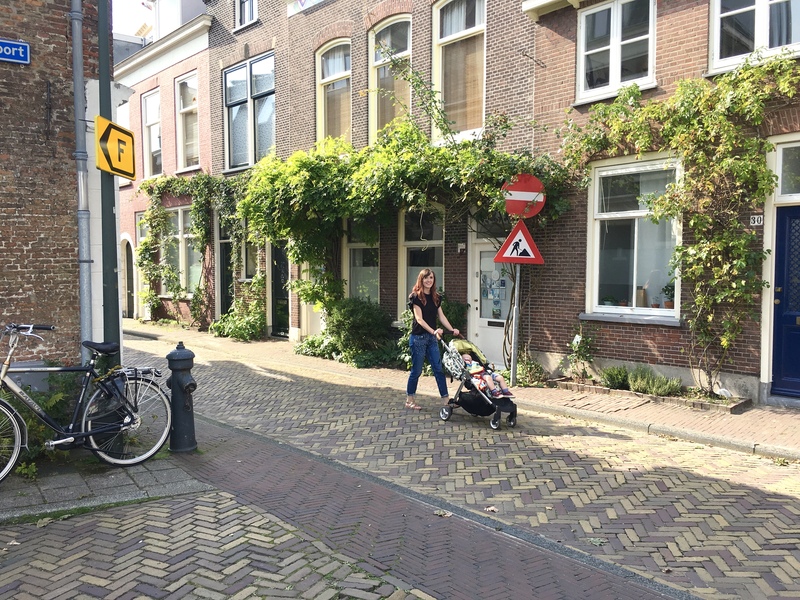 As soon as we’d finished, we popped Ezra back in his pram and went to explore a bit further out of the centre so he could drop off for a nap and to find Santi an ice cream. 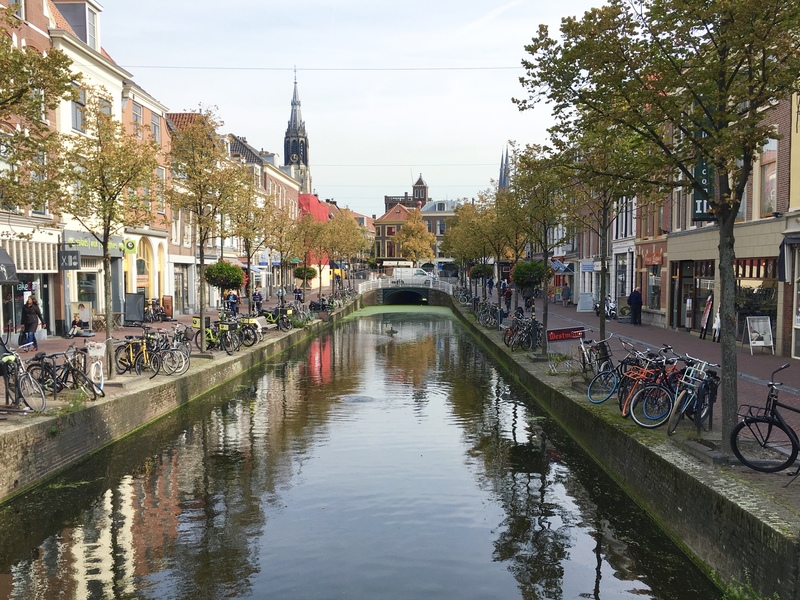 We purposely headed away from the shops so we could see more of Delft first … you can’t give away your bribe straight away! It was the warmest day we had on our holiday, and it was so nice to have some sun. Delft was seriously beautiful, and the light cast such a nice glow over the water. We got to a point where there was a canal junction, and all of a sudden there was a rush of tourist cruises passing us. Well that was Santi gone … he was running back and fore across the bridge waving at people as they passed under us, and again when they came out the other side. He must have been a sight because they were all laughing at him … that’s one way to liven up a tour! Stew had to hold him back as he waited for the boat to come through! 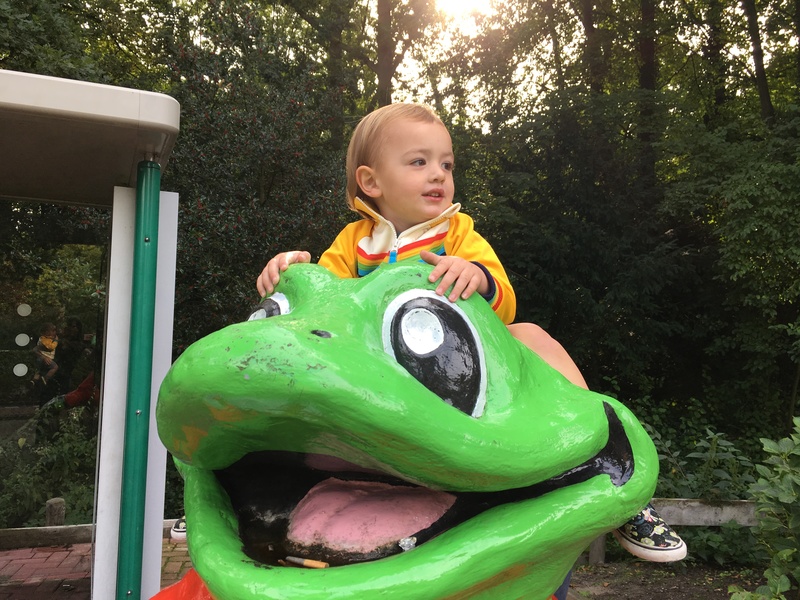 One of the things we missed while we were away was a means of transport for Santi. We haven’t used our buggy board for so long that we didn’t take it with us, but we didn’t think that the reason we don’t use it is because he’s usually on his scooter or balance bike. Stew ended up carrying him quite a lot during the week, but Santi made it impossible to say no as he’d cling on saying “I want to cuddle you all the way home”. Sneaky little thing! 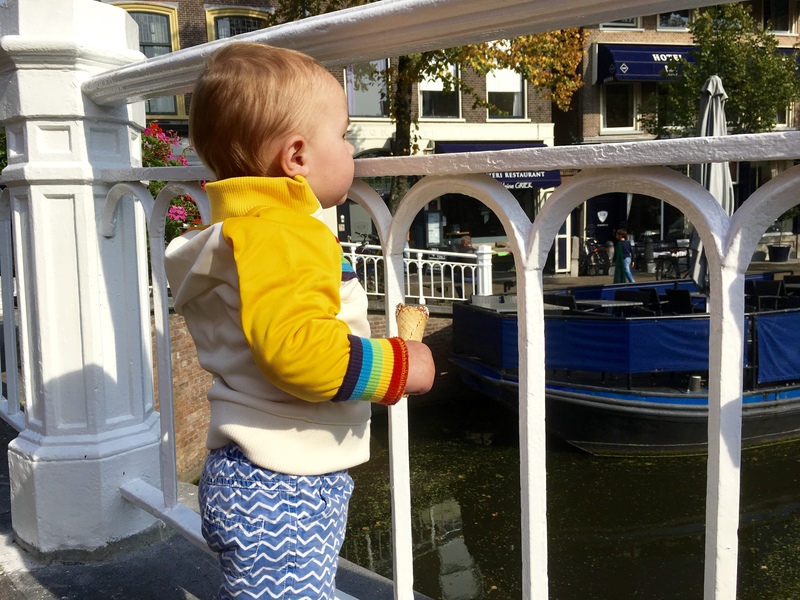 He soon perked up when we came across an ice cream shop … oh, and look who also decided to surface at the right time to steal my ice cream! Spot the rogue train sticker in my hair! It was time to head back to our Eurocamp after our ice creams, but it wasn’t such a calm journey this time. We ended up running for the train and bus, and I was told off by the bus driver for letting Ezra stand up (I was holding on to him). 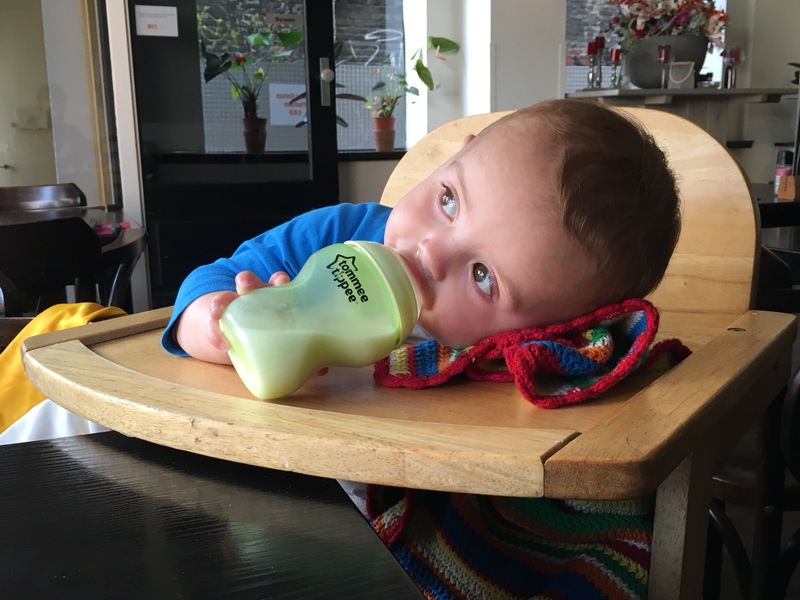 Ezra decided to repay him by crying for the rest of the journey … fun times! 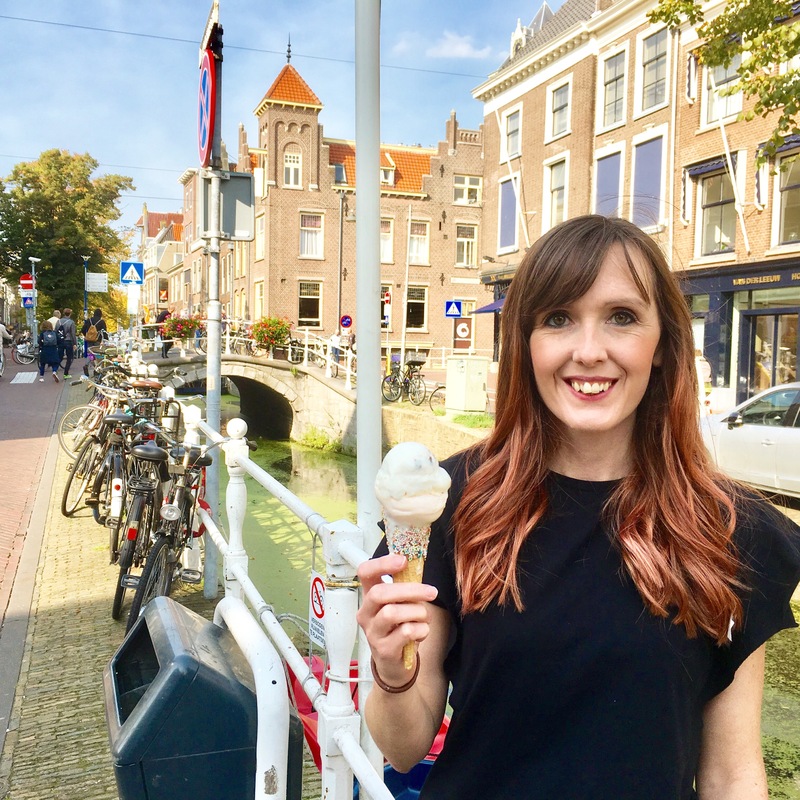 I was actually so pleased that we didn’t end up going into Amsterdam and spent the day in Delft instead. 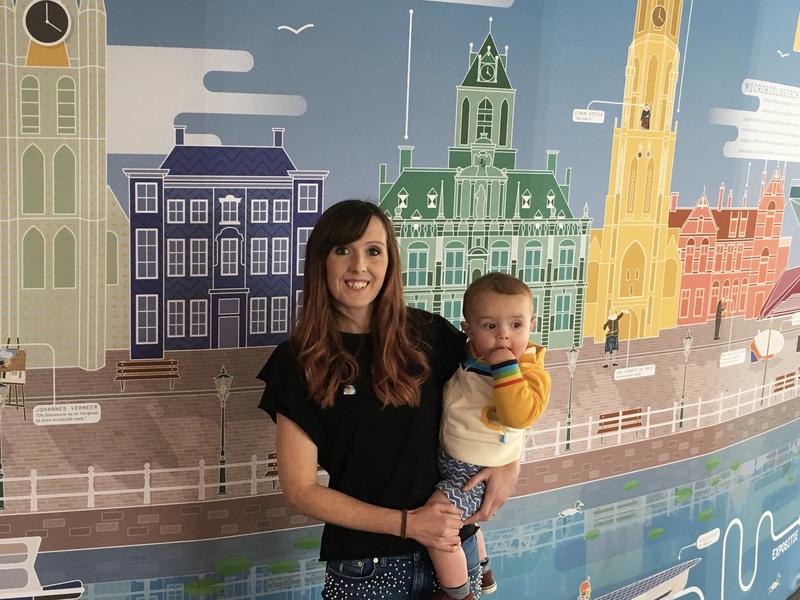 Amsterdam is a lovely place, and I’m sure we would have had a fab time, but it was such a chilled out day that it was definitely the right decision.